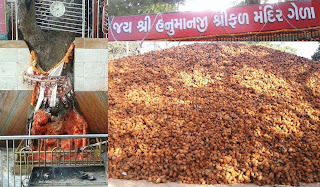 There are many Hanumanji temples around the world.But today i know about wonderful Hanumanji temple known as Gela Hanumanji Srifal(coconut) Temple which is located Gela village near tharad Banaskatha district Gujarat India.This temple is known as Srifal or Coconut temple.Here is soms fact about Gela Hanumanji Srifal Temple in Gela village Gujarat India. How to reach by Air :The Nearest Airport is Ahmedabad (204 KM). How to reach by Rail : The nearest railway station is Dhanera station(35 KM) and Palanpur (89KM). How to reach by Road or Bus :There are many public and private vehicals available to reach here. Gela Hanumanji temple is located in Gela village within 3 km far from Lakhani village near tharad Banaskatha district Gujarat India.The temple was built about 700 years ago.The temple is dedicated Lord Hanumanji. It is very popular as ‘Shrifal Mandir’ because one can see the mountain of coconut behind main deity idol of Hanumanji.Here are Balaram stone idol. Hanuman is the trunk of the tree sitting posture. It reminds of a mountain behind Bala ramji image. Many devotees come here every Saturday to watch and remind votive offerings.The miraculous khejada Hanuman is sitting under a tree. The temple is associated with the legend; approximately fifty - sixty years ago tharad asodara ascetic monastic in this hardev puri he came here and gave them to eat incense reminds children. 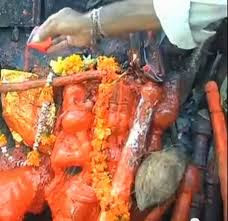 Every Saturday, thousand of devotees come here and take oath to put shrifals to Lord Hanuman against their wishes. 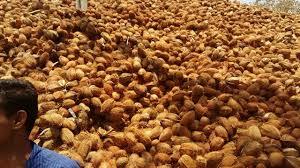 It is believed that around 6500 shrifals are put at this place on every Saturday and now mountain becomes more than 1.25 crores of coconuts. The Chaitra Poonam (Hanuman Jayanti) in the village of millions of devotees and the vision is wrong. Here people are deposits for meals by volunteers. As well as those who enjoy - Buoyancy is realized. The priest of the temple - a large birthday cake made ​​by the devotees of Hanuman and is divided among them as maha prasadi and shree coconut Hanuman meets all the prayers. As per local belief, no one can steal any coconut from this mountain and if he or she takes then has to put double of stolen quantity otherwise they surrounds under bad troubles in their life. One of the greatest wonder of these coconuts is that it remains always fresh and never become flavorless. It would not destroy in any weather. Here, any type of wishes of devotees are always comes true when they pray by heart and take oath to put one srifal or toran of srifal at this place.